We are a Halloween loving family (except all the creepy/gory stuff…gross). This year we are in a new home in an awesome neighborhood, and neighbors warned us to prepare for 1200 trick-or-treaters. Last year we had 0…bring it on! 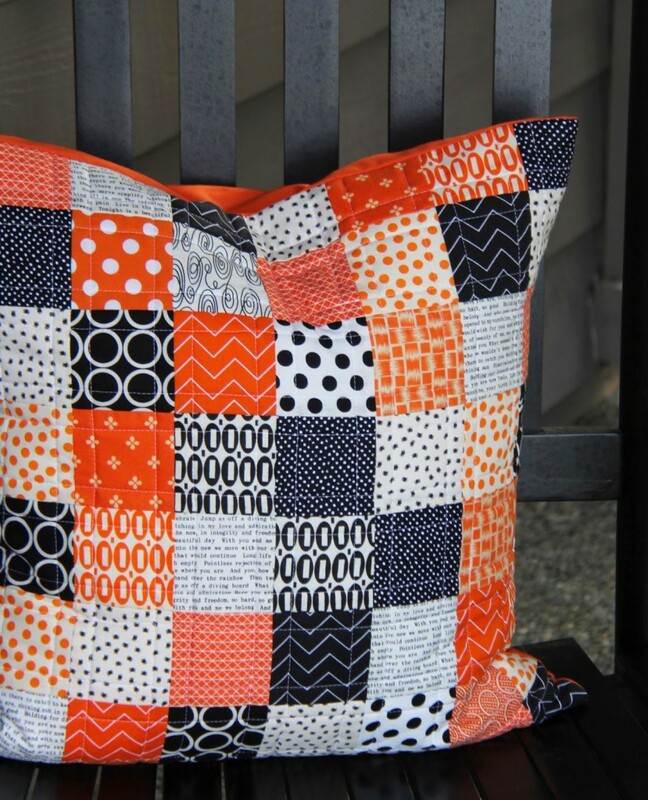 Anyways…I’ve been in a Halloween mood and broke out all the orange and black fabric I own for making pillows. 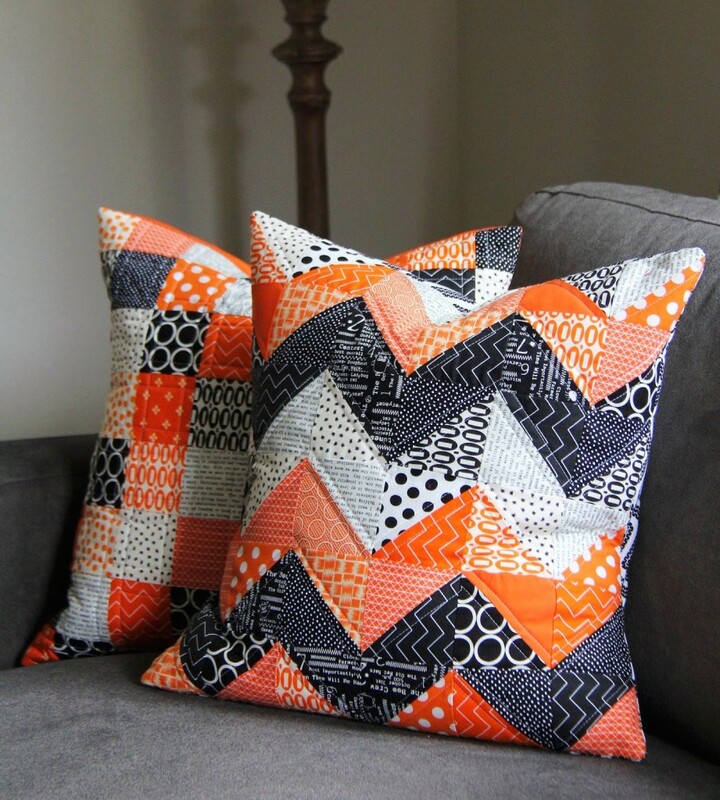 Pillows for the couch and for the porch….and they match my Halloween quilt perfectly! Super cute!!! I love the pillows and the quilt!!! I love all of it. The colors and prints are great. I am big on vintage Halloween. Creepy primitive not creepy gory. This is a wonderful time of the year! Really cute pillows. Maybe for Christmas. My daughter gets into Halloween big time but not for me. I will stick with the other holidays. You make even the simplest things cute. Perfect Halloween/fall theme without cutesy pumpkins and witches! Not that I have anything against pumpkins and witches…. Wow, you certainly look ready to greet 1,200 trick or treaters. I love how you've carried the theme through the pillows and quilt. How much do you have to spend buying treats for that many people? Halloween is relatively new in New Zealand. Some children trick or treat but a lot of people don't like it and think people should just go and buy their own treats. I loved those, and then your last line really made me laugh! Please don't poke your eyes out. I love your work too much! 1200? 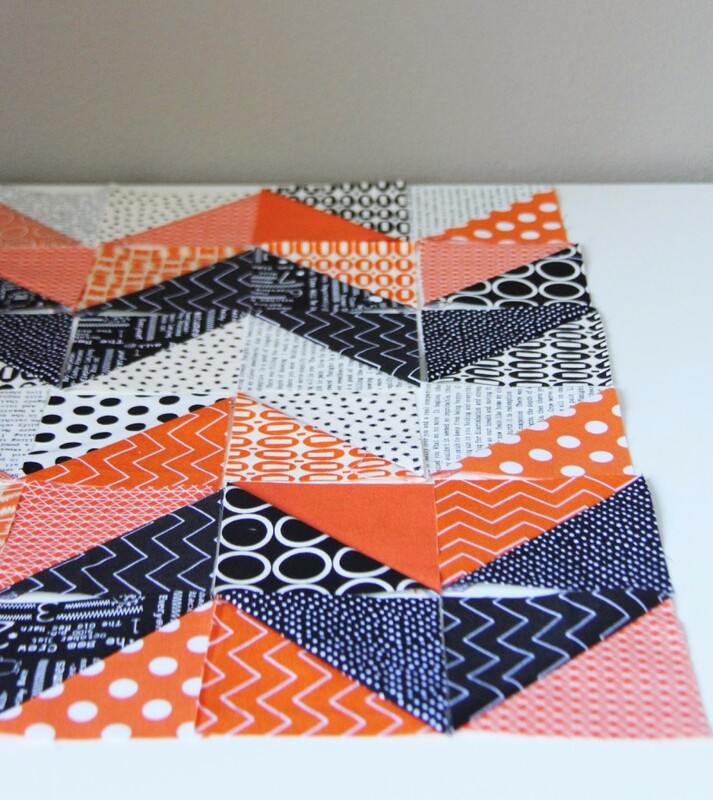 That may break the bank…..
Just looking at all that orange and black together makes my eyes hurt! I can see why you were ready to poke your eyes out. 1,200 trick-or-treaters?!? Wow! We used to get a couple of hundred where we lived before. In our current place, we get none even though the neighbourhood is full of kids. Yep Wendy….we already bought our candy and it was over 100! :) But it's sure fun! 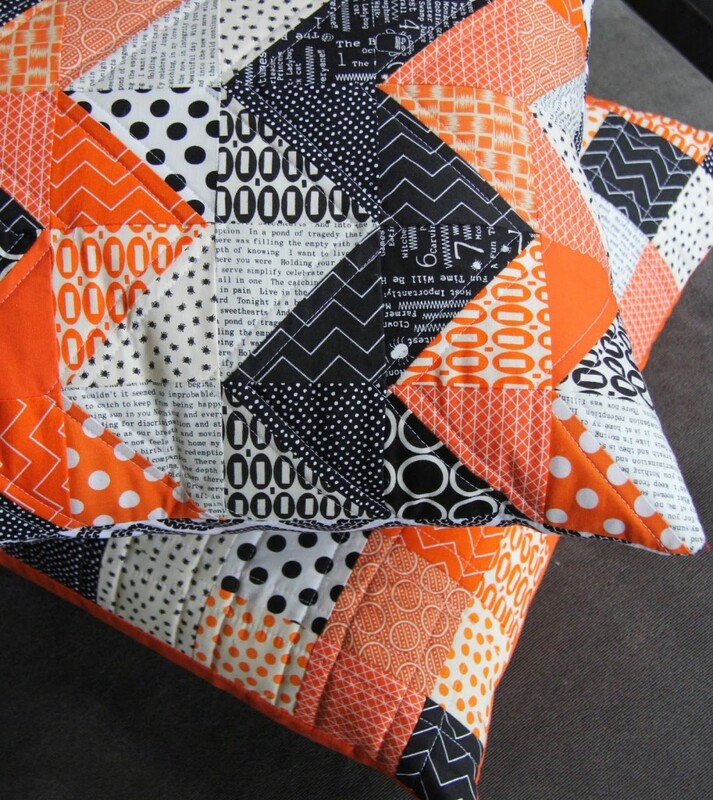 I love all of it, but especially the wonky orange, black, and white quilt! Keep your eye and enjoy your pillows and quilt! They really are wonderful. great cushions but I hide on halloween such a wimp! Love the orange/black combination. Have some of the same fabric in other colors in my stash. We don't have Halloween. Pitty! 1200! Your doorbell may give up! Really cool. Like the colors. These are beautiful! I love the patterns you chose and the fabrics are wonderful. Great job! Oh I love the pillows and the quilt! Even though I dont like halloween. So colorful and not scary! nope, you haven't mentioned the eyeball poking thing. You should see someone about that. I would imagine it would be hard to sew such beautiful things without your eyeballs in place ! LOVE the pillows! I would probably leave them out all year…or maybe not. I only like Halloween, but I love the colors. No poking out eyeballs!!!! aww so cute..orange and black is absolutely gorgeous! Love those pillows! Enjoy the trick or treaters. 1200 is a bit much though! Yikes! Last one we had was 12 years ago. We lived in a condo for one year and actually had trick or treaters, it was fun. My husband and I both grew up in quiet areas that nobody ventured into for candy. Love these! I need to make some for my house! You must have moved into my old neighbourhood! We did have 1200 trick or treaters. Our 'trick' was for one of us to take the kids round early-ish, and then sort out all the candy they wouldn't eat (licorice) and then hand that out to all the later trick or treaters! It pays to come early! So glad that you did not poke your eyes out, then you would have to go gorey. ;) Love the pillows and your quilt. That is a lot of candy. Okay, so your pillows are so adorable I went to the fabric store and bought some fabric. Now lets see if I can make mine as cute as yours! :) Thanks for sharing! Your pillows and quilt are fabulous! Have fun with all those trick or treaters!